1 Graduate Program in Fundamental Nursing, Ribeirão Preto College of Nursing, University of São Paulo (USP), Ribeirão Preto, SP, Brazil. 2 Graduate Program in Nursing, Federal University of São Carlos (UFSCar), São Carlos, SP, Brazil. 3 Department of Gerontology, UFSCar, São Carlos, SP, Brazil. 4 Department of General and Specialized Nursing, Ribeirão Preto College of Nursing, USP, Ribeirão Preto, SP, Brazil. Background: The number of older caregivers is getting bigger and it is important to know if they experience depressive symptoms because there can be consequences for both caregiver and care recipient. Objective: To analyze the recent publications related to the assessment of depressive symptoms in elderly caregivers. Methods: Lilacs and PubMed databases were reviewed associating the descriptors “caregivers” AND “aged” AND “depression”. Inclusion criteria were texts including primary data in Portuguese, Spanish or English, published between 2009-2013, also data which evaluated elderly caregivers (≥ 60) and depression or depressive symptoms. There were found n = 1129 texts and after applying the inclusion criteria n = 17 were selected and analyzed. Results: Geriatric Depressive Scale (-30 and -15 items) and Center for Epidemiologic Studies Depression scale were the most used scales to evaluate depressive symptoms in older caregivers. Caregivers were in the most of the cases female and cared for a family member with dementia. The majority of the texts that compared older caregivers to older non-caregivers found that caregivers had more depressive symptoms. Discussion: Early identification of depressive symptoms can help professionals to minimize damage in caregivers and in care recipient and to plan interventions focusing on improving quality of life of this specific caregiver group. Keywords: Older, depression, caregiver, review. The world is passing through a population aging phenomenon, which means a substantial increase in the number of elders in global population. In 1950 elderly people represented 8% of global population and were 202 million in number; by 2013, the percentage increased to 12% and reached 841 million. Projection to 2050 says this number will exceed two billion of elders in world; and by 2047, elderly people (more than 60 years old) will outnumber the children (less than 15 years old)1. Regarding elderly people, approximately 29% are living only with a spouse, and this number is bigger considering only the more developed regions. In less developed regions, multigenerational arrangements are more common, due the available resources to sustain the whole family1. Considering these factors, an elderly person at home is an eligible person to be an informal caregiver of another one who lives in the same house especially his/her spouse, dependent children or grandchildren. In United States, in 2009, it was estimated that 65.7 million of adult population were informal caregivers. Of these, 35% were between 50-64 years old, 9% between 65-74 and 4% 75 or older2. These data show that in the next years, with population ageing, there will be a great number of elderly informal caregivers in US, and therefore, in rest of the world. There are few studies in literature focusing specifically on older caregivers, a population that can have different needs to be elderly and caregiver. Both conditions can cause burden, stress, depression and further implications which can reflect in caregiver and in care recipient3,4. A published meta-analysis identified 168 published papers between 1980 and 2010 to look for differences among three groups of caregivers: spouses, son/daughter and son/daughter in law. They examined data from 28980 caregivers worldwide and showed that spouse caregivers were more likely to have physical and financial burden, also presented more depressive symptoms5. Depression diagnosis is based on patient and family reports, clinical interview and observation to see if he/she attends criteria for major depressive episode contained in the Diagnostic and Statistical Manual of Mental Disorders (DSM-V). Patient has to report at least one of these two symptoms every day in the last two weeks: depressed mood or loss of interest or pleasure in activities for most of the day. Additionally, patient has to report at least more three or four (depending if he/she reported one or both aforementioned symptoms) of following: significant loss or gain of weight, increased or decreased appetite; excessive sleep or insomnia; observable psychomotor agitation or retardation; fatigue or loss of energy; feelings of guilt or worthlessness; poor concentration or indecisiveness and recurrent thoughts of death or suicide ideation. The symptoms have to cause decrease and change in previous functioning; and cannot be attributable to medical conditions or substances6. Depression diagnosis in elders is important once this population has different needs and is considerably heterogeneous. There are lots of cases that are sub-threshold depressive symptoms, it is, are threshold to reach diagnosis criteria for depression. Thus, depressive symptoms are important indicators of elders health because they are associated with disability, greater use of health services and higher suicide risk. Early identification can help health professionals to determine their conduct7,8. There are many instruments used to evaluate depressive symptoms in adult population. Can be mentioned the Center for Epidemiological Studies – Depression Scales (CES-D)9,10 and Beck Depression Inventory (BDI)11. Specifically to older adult individuals, Geriatric Depressive Scale (GDS)12 was developed aiming to be simple and easy to understand by elderly. All of them were translated and validated in different languages, are used in many countries around the world and some have reduced versions to optimize time spent in their application13,14. Beyond these, there are a huge variety of instruments used worldwide to evaluate depressive symptoms. The current review aimed to analyze recent publications related to the assessment of depressive symptoms in elderly. To meet the aim of the study it was used the integrative literature review method. This method consists in selecting, analyzing, and synthetizing researches related to a specific literature topic, aiming to improve professional practice and to fill literature gaps15. The literature review comprises six steps: 1) identify the theme and research question; 2) determine inclusion and exclusion criteria; 3) data collection (select, summarize and organize information); 4) evaluation of manuscripts included in the review; 5) interpretation of results and 6) synthesis of knowledge16. Considering aforementioned factors, the main question was: what has been recently produced about older caregivers and evaluation of depressive symptoms? Regarding to the text selection, an online survey was conducted in two recognized database in South America and worldwide in the health field. The first one was LILACS (Literatura Latino-Americana em Ciências de Saúde), using the search strategy contained in DECs (Descritores em Ciências da Saúde): “Aged AND Caregiver AND Depression”. Survey in PubMed database used Mesh terms and their entry terms, resulting in the search strategy: ((Aged) OR (Elderly)) AND ((Caregivers) OR (Caregiver) OR (Care Givers) OR (Care Giver) OR (Carers) OR (Carer) OR (Family Caregivers) OR (Caregiver, Family) OR (Caregivers, Family) OR (Family Caregiver) OR (Spouse Caregi­vers) OR (Caregiver, Spouse)) AND ((Depression) OR (Depressions) OR (Depressive Symptoms) OR (Depressive Symptom) OR (Symptom, Depressive) OR (Symptoms, Depressive) OR (Emotional Depression) OR (Depression, Emotional) OR (Depressions, Emotional) OR (Emotional Depressions)). In both databases it was used the filter “published in last five years” and “published in English, Portuguese or Spanish”. The manuscripts inclusion criteria were: texts including primary data; published in Brazilian or international journals indexed in Lilacs or PubMed; in one of the three languages mentioned above; in last five years (2009-2013) and evaluated older caregivers (≥ 60 years old) and depression or depressive symptoms. The research was conducted through February 2014. All abstracts found were read and analyzed to see if they could fulfill the inclusion criteria. After this analysis and selection, full texts were accessed and read to determine if they really fulfilled inclusion criteria. Figure 1 illustrates the way to reach the final sample. From texts excluded in first step (only by reading the abstract), some of them were excluded because they did not use primary data and some of them because they did not evaluate specifically older caregivers or depression. The second step (reading of full text), one text of Lilacs search were excluded because it did not evaluate depression or depressive symptoms. In PubMed search, 70 were excluded after reading full text because it did not evaluate specifically older caregivers (n = 62), did not evaluate depression or depressive symptoms (n = 6) or both reason (n = 2). 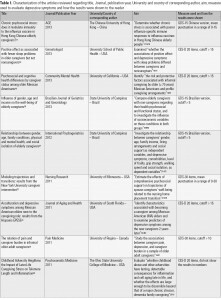 All 17 manuscripts included in the present review were read and analyzed regarding journal, publication year, University and country of corresponding author, language, aims, measures used to evaluate depression or depressive symptoms and main results and conclusions related to depression/depressive symptoms. Data were summarized and presented in tables and figures. For some variables contained in the articles, it was calculated percentage, mean, standard deviation, median, maximum and minimum. 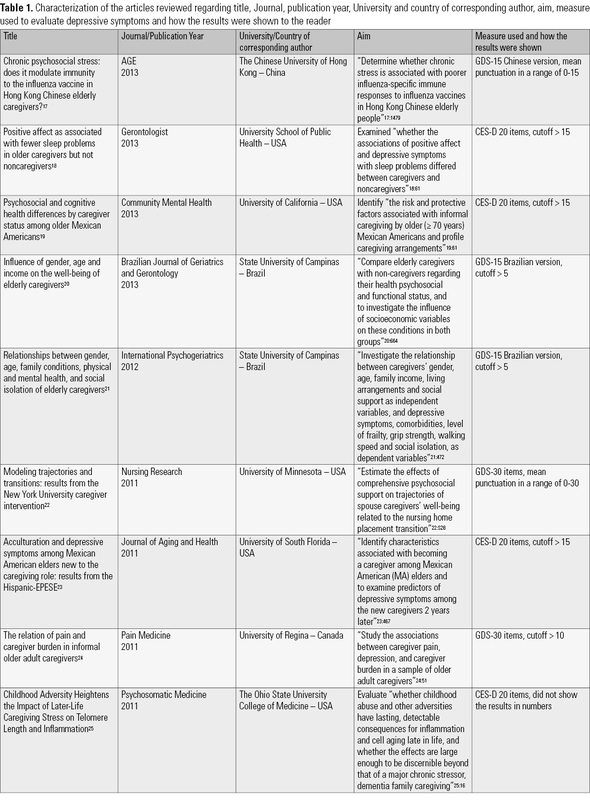 Table 1 presents characterization of 17 papers included in present review regarding title; journal and publication year; University and country of corresponding author, aim, measure used to evaluate depressive symptoms and how the results were shown to the reader. Regarding the publication year, four manuscripts were published in each of the years: 2009, 2010, 2011 and 2013; and only one in 2012. In relation to publication country, the majority of corresponding authors worked for universities located in USA (47.1%), 17.6% in Brazil, 11.7% in Australia; and China, Canada, Sweden and Taiwan wrote one publication each (5.9%). All analyzed publications were published in different journals and the only university which published two texts included in this review was State University of Campinas (Unicamp), Brazil. Regarding publication language, 15 (88.3%) were published in English and two (11.7%) in Portuguese. As shown in table 1, texts analyzed used five different instruments to evaluate depressive symptoms: GDS -30 and -15 items, CES-D 20 items, BDI, Goldberg anxiety and depression scales – 18 items and DASS short version. GDS was developed in 1983 by Yesavage et al.12. In original version, it had 30 items aimed to screening the presence of depressive symptoms in elderly individuals. The Scale consists of 30 “yes” or “no” questions which sum ranges from 0-30 points. In 1986 Sheikh and Yasavage14 developed the short version of the scale with 15 items. Additional versions were developed and tested, with ten, five and even one question. GDS was translated and validated to more than 30 languages and it is widely used worldwide to evaluate elderly population. CES-D was elaborated by National Institute of Mental Health (USA) to identify depressive humor in population studies9. Measure is consisted by a 20 items self-reported questionnaire varying from 0-3 points each, with a possible total range from 0-60. The cutoff score is 15 points, and scores over 15 indicate depressive symptoms. It was translated and validated to many languages and cultures, and has good consistence indices. CES-D was not developed specifically to be applied in older adults, but it is largely used in general population and in elderly individuals10. BDI was first published in 1961 based on clinical observation of depressed and non-depressed patients and their attitudes and symptoms. They were consolidated in a 21-item scale that can vary from 0-3 in terms of intensity, summing a possible range from 0 to 6311. It was revised in 1971 and there is a second version called BDI-II (1996), to reach the updated DSM-IV criteria for depression. It can be applied even in adults or older adults13. Goldberg anxiety and depression scales were developed in 1988 and have two parts, the anxiety and the depression scale, composed by nine items and producing a score from 0-9 each. They access anxiety and depression symptoms in last four weeks and can be applied even in adults or older adults34. DASS was developed in 1995 by Lovibond and Lovibond and is composed by three scales called depression, anxiety and stress. Short version contains a total of 21 questions (seven for each scale) varying from 0-3, totalizing a possible range from 0-63. It can be applied in adults in general, including older ones35,36. The majority of the manuscripts (41.1%) applied GDS to evaluate depressive symptoms (23.5% GDS-30 and 17.6% GDS-15), 35.3% applied CES-D 20 items, 11.7% BDI; 5.9% Goldberg anxiety and depression scales – 18 items and 5.9% DASS short version. By analyzing the articles’ results it was possible to see that 52.9% evaluated only familiar caregiver17,20-22,25,29-32 and in 47.1% caregiver could be even familiar or not18,19,23,24,26-28,33. According to the referred literature, the majority of caregivers are familiar; spouses, daughters and mothers are the first ones to assume the caregiving role when a family member needs some assistance5. Considering the US caregivers in 2009, 86% were caring for a relative and 14% for a friend, neighbor or non-relative. Caregivers aged 65 or over are more likely to care for a spouse when compared to younger ones2. According to the Administration on Aging, over 90% of elderly people with chronic disabilities received care, and about 65% received only informal care from family or friends37. A general survey conducted in Canada in 2007 showed that the number of caregivers aged 45 and older increased from approximately two million in 2002 to 2.7 million in 2007, and 70% of these caregiver group provided care to a family member38. The age limit used to designate caregivers in studies analyzed in present review was in 35.3% of the cases ≥ 60 years17,18,24,27,31,32 and in 29.4% ≥ 65 years20,21,23,28,33. Three texts (17.6%) did not mention any limit, but in results it was possible to see all caregivers were older adults22,25,30. In one case only caregivers between 64-69 years26 were included, another case included only caregivers ≥ 70 years19 and one publication was a case study and included only two participants (72 and 74 years old)29. The majority of manuscripts included caregivers who care for someone with Alzheimer Disease (AD) or other type of dementia (35.3%)18,22,25,29,30,32. In 23.5% there were grouped caregivers of people with chronic conditions, limitations in Activities of Daily Living, disability, memory problems and physically frail17,19,26,33; 11.7% included caregivers who reported to care for a spouse and/or parents in the past five years20,21; 11.7% who care for someone with AD or physically disabled24,28; two texts (11.7%) who reported became a caregiver recently (called recent caregiver)23,27; and one who care for a biological grandchildren31. According the World Health Organization (WHO), the number of people with dementia in world in 2010 was estimated at 35.6 million and is projected to reach 115.4 million in 2050. These growths has become a challenge once dementia is one of the major causes of disability and has a remarkable impact on family, particularly on primary caregiver39. The analyses of caregivers in US in 2009, indicated 22% of care recipients suffering for AD or mental confusion2. Estimations shows that 15-32% of dementia caregivers experience a depressive disorder and nearly a half to three quarters of them are affected by depressive symptoms39. The way each AD caregiver experiences these symptoms varies, which highlights the importance to early depressive symptoms identification. Regarding the number of caregivers in studies analyzed, minimum was 2 (a case study)29 and the maximum was 385222. Minimum was 129.79 ± 120.84 and median was 92 participants. Previous numbers referred only to caregivers, not considering the manuscripts which evaluated caregiver and noncaregiver groups. Two articles did not mention demographic characterization of caregiver group (only of the total sample composed by caregivers and noncaregivers) and were not included in following analyses. Considering 15 texts, most of them caregivers were female. The percentage varied from 50%30 to 100%, and in this last there were only two participants, both female29. The mean percentage of female caregivers was 69.56%. Age of caregivers varied in mean from 66.6 to 78.46 years, and the mean of age in the 15 texts included in this analysis was 67.35 years. Regarding caregiving in US in 2009, 66% were female2 and in Canada in 2007, percentage was 57%38. Of caregivers aged 45 and over, 16% were 65-74 and 8% 75 and older38. A meta-analysis of 168 papers found spouse caregivers were on average 69.8 years old and 64.8% were female5. Figure 2. Flowchart of the group division in the articles analyzed. To better illustrate the results of the articles, they were divided in two groups as shown in figure 2. 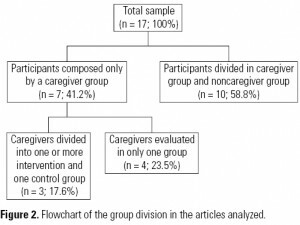 Texts in which participants were divided in caregiver group and noncaregiver group, corresponded for 58.8% of total17-20,23,25,26,28,31,33, and texts in which participants composed only by a caregiver group for 41.2%21,22,24,27,29,30,32. The ones including a single caregiver group were divided in articles that inside the caregiver group there was at least one intervention group (17.6%)22,30,32 and articles evaluating only one group (23.5%)21,24,27,30. The presented analysis focuses only on evaluating depressive symptoms contained in the 17 texts included. Manuscripts of present review assessed other aspects of older caregivers, and if it is reader’s interest, articles can be consulted in the reference section. Ten texts evaluated two groups, one composed by caregivers and one composed by noncaregivers. Six of them found caregiver group had statistically significant more depressive symptoms than noncaregivers group17,19,23,25,26,28. 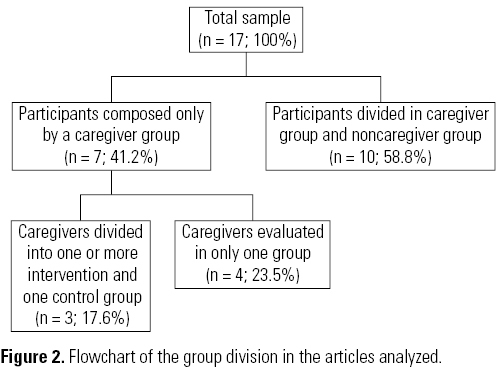 Two texts found higher means in caregiver group, but difference was not statistically different or they were not compared statistically18,31; one manuscript found higher percentage of depressive symptoms in noncaregiver group, but they were not compared33; and one found higher percentage in noncaregivers group too, but without significant differences20. The majority of studies included in the present review concluded that older caregivers had statistically more depressive symptoms than older noncaregivers. Consequently, the role of care can lead to important emotional consequences. A meta-analysis evaluated 84 articles which compared a sample of informal caregivers of older adults to a sample of noncaregivers regarding perceived stress, depression, and other variables. It has found the majority of articles evaluated caregivers of older adults with dementia (63.3%) and included female caregivers (72%), just like found in present study. Additionally, caregivers were more stressed and depressed than noncaregivers40. Considering the aforementioned, some aspects of care need to be accompanied closer by health professionals, because the consequences can be drastic to care recipient and even to caregiver41. Four texts analyzed only a caregiver group. The first concluded that 20.11% of caregivers had depressive symptoms21, and in the second percentage was 36%24. Third, an article applied DASS short version, with possible range varying from 0-63. The mean of caregivers was 17.9 at baseline and 14.6 four months after, but without significant differences27. And finally, the other text was a case study in which one case scored 14, indicating mild to moderate depression; and the other 17, indicating moderate to severe depression in BDI29. One article divided caregivers into two groups: one received a comprehensive psychosocial support and one did not receive. Before intervention, one group scored 10.33 in GDS-30 and other 8.97. Of the total sample, 54.5% of care recipients went to an institution from 5 to 9 years on average. Immediately after institutionalization, depressive symptoms did not show reduction for spouse caregivers22. Another text divided caregivers into three groups: collaborative memory intervention, individual intervention and control. Before intervention the mean was 7.82 in BDI and after 9.18 (p < 0.02) for total sample. Intervention was not responsible for changes in depressive scores. An increase in BDI scores was attributed to the disease progression of care recipient30. One text included only caregivers who had previous indicators of depressive symptoms (scored > 10 in GDS-30 at baseline). A half of caregivers received a crania electrical stimulation and a half did not. After four weeks of intervention both scores declined to 9.05 in intervention group and 9.45 in nonintervention group in mean, but these differences were not significant32. Lastly, there will be exposed here the mean of caregivers punctuation in scales used to evaluate depressive symptoms and percentage of caregivers that were considered with depressive symptoms. The presented data referred only of texts with this information accessible and considered only pre-test evaluation (baseline) when available. – GDS-15 (mean punctuation in a range of 0-15): 717. – GDS-15 (percentage of caregivers scoring > 5 points): 19.8%20 and 20.11%21. – GDS-30 (mean punctuation in a range of 0-30): 10.33 and 8.9722; 9.1524 and 4.1321. – GDS-30 (percentage of caregivers scoring > 10 points): 36%24 and all caregivers included32. – CES-D (mean punctuation in a range of 0-60): 8.0219; 12.1723 and 10.3228. – CES-D (percentage of caregivers scoring > 15 points): 19.6%18; 14.1%19; 30.3%23; 24%28 and 7.7%33. – BDI (mean punctuation in a range of 0-63): 7.8230. – The Goldberg anxiety and depression scales – 18 items (mean punctuation in a range of 0-18): 4.726. – Depression Anxiety Stress Scale (DASS) short version (mean punctuation in a range of 0-63): 17.927. A higher prevalence of depressive symptoms in GDS was found in a study in which all caregivers included had depressive symptoms, but inclusion criteria of the study was a previous indicator of depressive symptom32. Despite these criteria, a higher prevalence (36%) was found in a study evaluating caregivers who care for individuals with AD or physically disabled24. Using CES-D, higher prevalence (30.3%) was found in a text which evaluated recent caregivers23. Nowadays, depression is estimated to affect 350 million people in the world42. Prevalence of major depression in older adults (caregivers or not) according to a review of 34 studies varies from 0.4% to 10.2%43. This number is even higher when considering only depressive symptoms. A review included 122 articles and related the prevalence of depression and depressive symptoms in old age. It found a variation from 7.2-36% in US when CES-D scale was used. Prevalence of depressive symptoms in European countries range from 14% in France to 49% in Italy, using the same scale. Using other scales, percentage varies from 5% in US to 25% in Spain and even 30% in Italy44. The numbers of general elderly population do not differ much from those found in present study. The present study aimed to analyze recent publications related to evaluation of depressive symptoms in older caregivers. Seventeen already published articles in different journals in gerontology, mental health, psychology, psychiatry, nursing and medicine fields were examined and reviewed. The USA lead publications, but it was possible to note other countries focusing their attention in older caregiver question. The most used scale was GDS (-30 and -15 versions) and CES-D 20 items. Regarding older caregiver, most were females who cared for a family member with AD or dementia. The percentage of depressive symptoms was similar to that found in past studies conducted with elderly in general, caregivers or not. But looking to the texts which compared older caregivers to older non-caregivers groups, the majority found older caregivers had more depressive symptoms than non-caregivers. Results demonstrated older caregiver is a specific group that can have specific needs and require attention and periodic evaluations. Early identification of depressive symptoms can help professionals to minimize damage in caregivers and in care recipient. Results can help health professionals to plan intervention aimed to improve quality of life of this population. United Nations. Department of Economic and Social Affairs. Population Division. World Population Ageing. New York: United Nations; 2013. National Alliance for Caregiving. Caregiving in the U.S [Internet]. 2009 [cited 2014 Feb]. Available from: http://www.caregiving.org/data/Caregiving_in_the_US_2009_full_report.pdf. Rodrigues SLA, Watanabe HAW, Derntl AM. The health of the elderly that care for elders. J São Paulo School of Nurs. 2006;40(4):493-500. Camargo RCVS. Implications on the mental health of elderly caregivers: an urgent need for formal support. SMAD Electronic J Ment Health, Alcohol Drugs [Internet]. 2010;6(2):231-54. Pinquart M, Sorensen S. Spouses, adult children, and children-in-law as caregivers of older adults: a meta-analytic comparison. Psychol Aging. 2011;26(1):1-14. American Psychiatric Association. Diagnostic and Statistical Manual of Mental Disorders. Fifth Edition. Arlington, VA: American Psychiatric Association; 2013. Rodda J, Walker Z, Carter J. Depression in older adults. BMJ. 2011;343:d5209. Bojorquez-Chapela I, Villalobos-Daniel VE, Manrique-Espinoza BS, Tellez-Rojo MM, Salinas-Rodríguez A. Depressive symptoms among poor older adults in Mexico: prevalence and associated factors. Pan Am J Public Health. 2009;26(1):70-7. Radloff LF. The CES-D Scale: a self-report depressive scale for research in the general population. J App Psych Meas. 1977;1:385-401. Batistoni SST, Neri AL, Cupertino AP. Validity and reliability of the Brazilian version of the Center for Epidemiological Scale – Depression (CES-D) in Brazilian elderly. Psico USF. 2010;15(1):13-22. Yesavage JA, Brink TL, Rose TL, Lum O, Huang V, Adey M, et al. Development and validation of a geriatric depression screening scale: a preliminary report. J Psychiatr Res. 1983;17(1):37-49. Beck AT, Steer RA, Garbin MG. Psychometric properties of the Beck Depression Inventory: twenty-five years of evaluation. Clin Psychol Rev. 1988;8:77-100. Sheikh JI, Yesavage JA. Geriatric Depression Scale (GDS): recent evidence and development of a shorter version. Clin Gerontol. 1986;5(1/2):165-73. Torraco RJ. 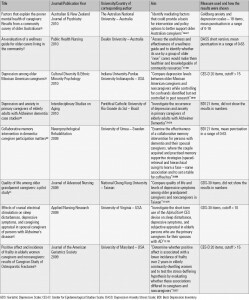 Writing Integrative Literature Reviews: guidelines and examples. Hum Resource Dev Rev. 2005;4(3):356-67. Mendes KDS, Silveira RCCP, Galvão CM. 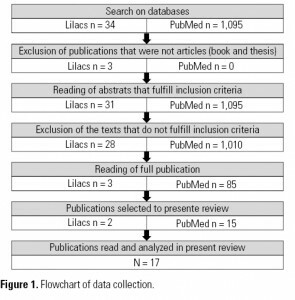 Integrative literature review: a research method to incorporate evidence in health care and nursing. Text Context Nurs. 2008;17(4):758-64. Wong SYS, Wong CK, Chan FWK, Chan PKS, Ngai K, Mercer S, et al. Chronic Psychosocial stress: does it modulate immunity to the influenza vaccine in Hong Kong Chinese elderly caregivers? AGE. 2013;35:1479-93. Fredman L, Gordon SA, Heeren T, Stuver SO. Positive affect is associated with fewer sleep problems in older caregivers but not noncaregivers. Gerontologist. 2014;54(4):559-69. Herrera AP, Mendez-Luck CA, Crist JD, Smith ML, Warre R, Ory MG, et al. Psychosocial and cognitive health differences by caregiver status among older Mexican American. Community Ment Health J. 2013;46:61-72. Tomomitsu MRSV, Perracini MR, Neri AL. Influence of gender, age and income on the well-being of elderly caregivers. Brazilian J Geriatr Gerontology. 2013;16(4):663-80. Neri AL, Yassuda MS, Fortes-Burgos ACG, Mantovani EP, Arbex FS, Torres SVST, et al. Relationships between gender, age, family conditions, physical and mental health, and social isolation of elderly caregivers. Int Psychogeriatr. 2012;24(3):472-83. Gaugler J, Roth DL, Haley WE, Mittelman MS. Modeling trajectories and transitions: results from the New York University Caregiver Intervention. Nurs Res. 2011;60(3Suppl):S28-S37. Hahn EA, Kim G, Chiriboga DA. Acculturation and depressive symptoms among Mexican American elders new to the caregiving role: results from the Hispanic-EPESE. J Aging Health. 2011;23(3):417-32. Jones SL, Hadjistavropoulos HD, Janzen JA, Hadjistavropoulos T. The relation of pain and caregiver burden in informal older adult caregivers. Pain Med. 2011;12:51-8. Kiecolt-Glaser JK, Gouin JP, Weng NP, Malarley WB, Beversdorf DQ, Glaser R. Childhood adversity heightens the impact of later-life caregiving stress on telomere length and inflammation. Psychosom Med. 2011;73(1):16-22. Butterworth P, Pymont C, Rodgers B, Windsor TD, Anstey KJ. Factors that explain the poorer mental health of caregivers: results from a community survey of older Australians. Aust N Z J Psychiatry. 2010;44:616-24. O´Connell B, Heslop L, Fennesy H. An evaluation of a wellness guide for older carers living in the community. Public Health Nurs. 2010;27(4):302-9. Hernandez AM, Bigatti SM. Depression among older Mexican Americans caregivers. Cult Divers Ethnic Minority Psychology. 2010;16(1):50-8. Valentini IB, Zimmermann N, Fonseca RP. Depression and anxiety in primary caregivers of elderly adults with Alzheimer Dementia: cases studies. 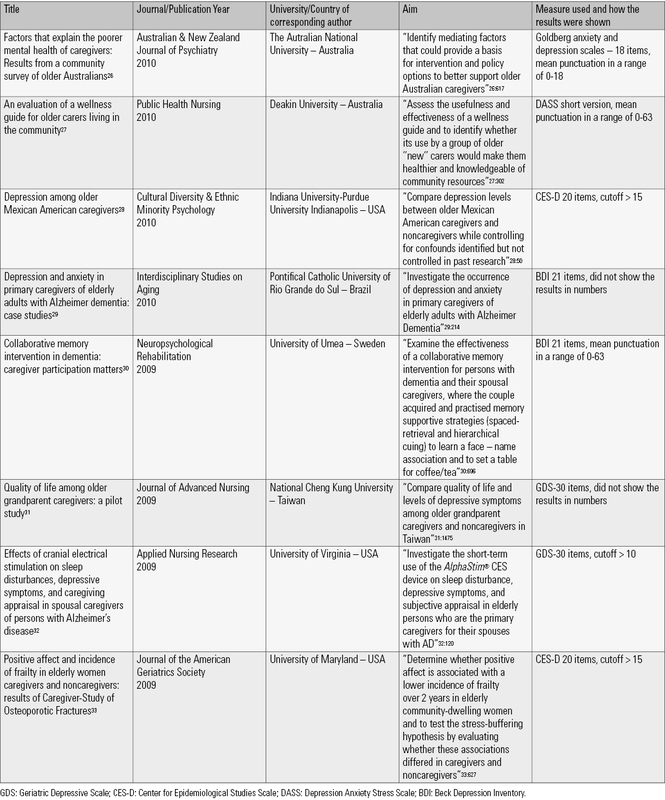 Interdisciplinary Studies on Aging 2010;15(2):197-217. Neely AS, Vikstrom S, Josephsson S. Collaborative memory intervention in dementia: caregiver participation matter. Neuropsychol Rehabil. 2009;19(5):696-715. Lo M, Liu YH. Quality of life among older grandparents caregivers: a pilot study. J Adv Nurs. 2009;65(7):1475-84. Rose KM, Taylor AG, Bourguignon C. Effects of cranial electrical stimulation on sleep disturbances, depressive symptoms, and caregiving appraisal in spousal caregivers of persons with Alzheimer´s Disease. Appl Nurs Res. 2009;22(2):119-25. Park-Lee E, Fredman L, Hochberg M, Faulkner K. Positive affect and incidence of frailty in elderly women caregivers and noncaregivers: results of Caregiver-Study of Osteoporotic Fractures. JAGS. 2009;57(4):627-33. Goldberg D, Bridges K, Duncan-Jones P, Gayson D. Detecting anxiety and depression in general medical settings. BMJ. 1988;297(6653):897-9. Lovibond SH, Lovibond PF. Manual for the depression Anxiety Stress Scales. 2nd ed. Sydney, Australia: Psychology Foundation of Australia; 1995. Antony MM, Bieling PJ, Cox BJ, Enns MW, Swinson RP. Psychometric properties of the 42-Item and 21-Item versions of the Depression Anxiety Stress Scales in clinical groups and a community sample. Psychol Assessment. 1998;10(2):176-81. Administration on Aging. US Department of Health and Human Services. A profile of older Americans [Internet]. 2011 [cited 2014 Feb]. Available from: http://www.aoa.gov/AoAroot/Aging_Statistics/Profile/2011/docs/2011profile.pdf. Cranswick K, Dosman D. Eldercare: what we know today. Canadian Social Trends. Component of statistics Canada Catalogue nº 11-008:48-56. World Health Organization. Dementia: a public health priority. Geneva; World Health Organization; 2012. Pinquart M, Sorensen S. Differences between caregivers and noncaregivers in psychological health and physical health: a meta-analysis. Pshycol Aging. 2003;18(2):250-67. Ostwald SK. Who is caring for the caregiver? Promoting spousal caregiver’s health. Fam Community Health. 2009;32(1S):S5-14. Marcus M, Yasamy T, Ommeren M, Chisholm D, Saxena S. Depression: a global public health concern [Internet]. 2012 [cited 2014 May]. Available from: http://www.who.int/mental_health/management/depression/who_paper_depression_wfmh_2012.pdf. Beekman AT, Copeland JR, Prince MJ. Review of community prevalence of depression in later life. BJP. 1999;174:307-11. Djernes JK. Prevalence and predictors of depression in populations of elderly: a review. Acta Psychiatr Scand. 2006;113:372-87.